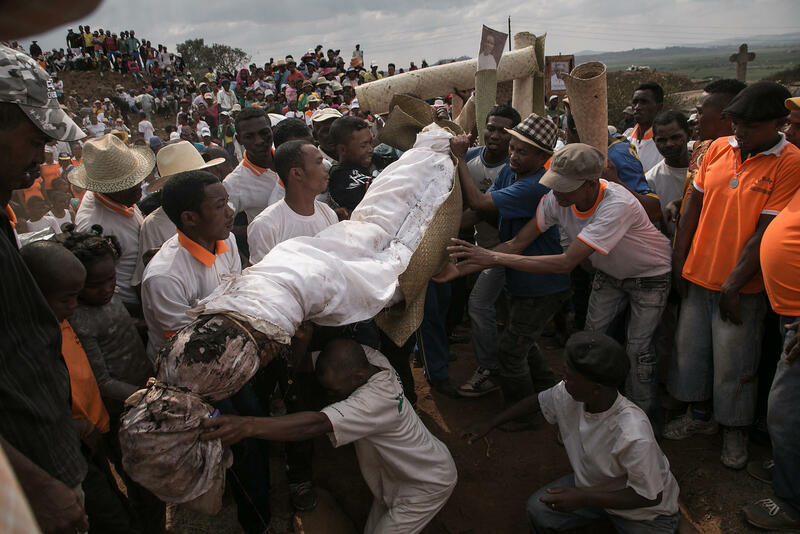 RIJASOLO | People carry a body wrapped in a sheet as they take part in a funerary tradition called the Famadihana in the village of Ambohijafy, a few kilometres from Antananarivo, on September 23, 2017. 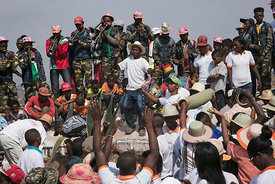 During the Famadihana, which can be translated as "turning of the bones", several crypts are opened and people take the bodies of their ancestors from the family crypts and rewrap them in fresh cloth, then dance with the corpses in their arms at the pace of traditional Malagasy band's music. The Famadihana is a pillar in the Malagasy ancestor's worship and is celebrated each three, five or seven years. People carry a body wrapped in a sheet as they take part in a funerary tradition called the Famadihana in the village of Ambohijafy, a few kilometres from Antananarivo, on September 23, 2017. 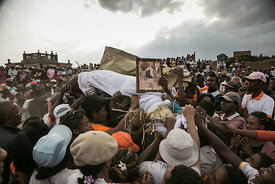 During the Famadihana, which can be translated as "turning of the bones", several crypts are opened and people take the bodies of their ancestors from the family crypts and rewrap them in fresh cloth, then dance with the corpses in their arms at the pace of traditional Malagasy band's music. The Famadihana is a pillar in the Malagasy ancestor's worship and is celebrated each three, five or seven years.